70s Sweden. What do you think of? If you didn’t say ABBA, there’s something wrong with you. 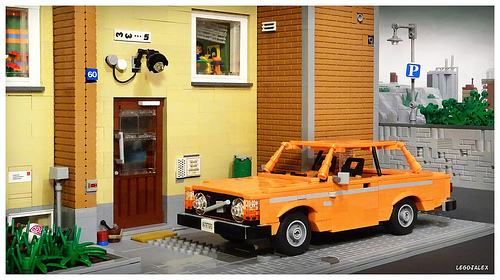 But here’s a fabulous LEGO diorama from LegoJalex which manages to capture the era perfectly without a hint of the Scandi-SuperTroupers. We’ve got an excellent orange Volvo 242 in the driveway, but for me, it’s the surrounding scenery and attention to detail which make this model pop. I love the textures of the different walls, the use of forced perspective to create the buildings and factories in the distance, and the little touches like the pail and the abandoned football in the grass.